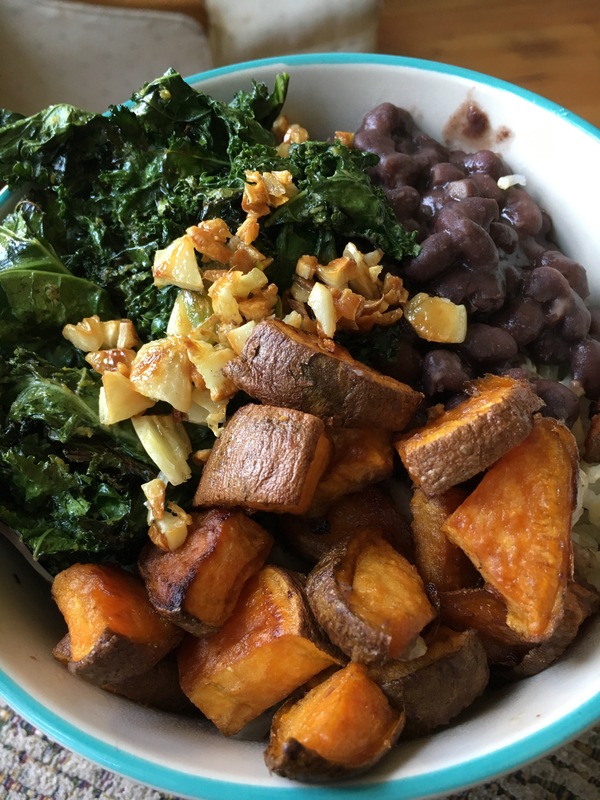 This brown rice bowl topped with kale, black beans, sweet potatoes and fried garlic will be sure to please your palate and your stomach. I was surprised by how much I enjoyed this simple, nutritious meal. That bowl didn’t stand a chance against me. The first step will be to set the oven to 350 so we can get the sweet potatoes baking. Put the sweet potatoes in an oven safe dish, drizzle some coconut oil and give them about 10 sprays of liquid aminos (or about 1 teaspoon of soy sauce). Put them in the oven and set your timer for 35 minutes. Make sure you take them out halfway to stir them around. When the timer goes off, you can just turn the oven off and keep them in their to stay warm. While the sweet potatoes are baking you will want to cook the rice. The directions on how to cook the rice will vary depending on what brand you buy and if it’s instant or not. Mine was not instant so I put a 1 cup of rice in a pot with 2 1/2 cups of water, a dash of salt, and a drizzle of olive oil. I brought all that to a boil for about 2 minutes and then covered and reduced to low for 40 minutes. Now we can start cooking the black beans, kale, and fried garlic. All you will need to do for the kale is de-stem it (the stems are bitter and hard), throw it in a pan, drizzle with olive oil, season with salt and nutritional yeast, and cook on low to medium heat for about 10 minutes. I love when some of the pieces of kale get a little crunchy. For the black beans you will need to strain most of the liquid out of the can, I would say about 3/4 of the liquid. Dump the can with some liquid into a pot and add a dash of rice wine vinegar, paprika, garlic powder, and a pinch of salt. The black beans are cooked already so you really just need to warm them up. I used about 8 cloves of garlic for the fried garlic because I am a garlic freak, but you certainly don’t have to. Use however much you think you will enjoy. Drizzle some olive oil into pan and turn the burner on to low/medium heat. Mince your garlic, throw it in, and let it cook for about 5-10 minutes. Stir every now and again. Now you’re all ready to layer it up and eat! Easy right?